that help promote reading, creativity and laughter in the library. Ventriloquist Richard Paul is an award winning Children's Author of two picture books, "The Magic Telescope" and "Red Riding Hood Races the Big Bad Wolf." His books have been featured in the Wall Street Journal, Detroit News and Detroit Free Press and have had appearances on Fox News and WDIV in Detroit. Richard offers up a funny, interactive library show that can be customized to your libraries summer reading program, theme or special event. His multitude of puppet characters, storytelling abilities and audience participation work well to complement any theme or library literacy event. Richard explains that when he was in fifth grade during summer vacation, he checked out a book from his local library that would change his life. It was a book that taught him how to become a ventriloquist by famed ventriloquist, Paul Winchell. He explains how he read and reread the book and practiced the lessons every day. The following summer he started to perform ventriloquist shows in his parent's garage, charging ten cents to get in and twenty five cents to get out. Prior to each library show, Richard will talk to the librarian to see if the library has books on ventriloquism and kid jokes that they can display prior to and after the show. If they are not on hand he will email the librarian a list of suggestions that kids can ask for or purchase at their local book store. Richard will be happy to help brainstorm ideas for sponsorships, local promotional ideas and supply printable posters, press release and pictures. Exploring your Imagination - A summer reading program that explains to student why reading is so important and how it helps to expand their knowledge and their imagination. Special volunteers are asked to come up on stage to present a puppet show and also help Richard produce a scene from a TV Show. 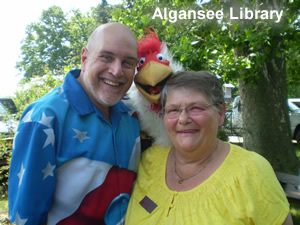 The puppets, the audience interaction help promote and or kick off a summer reading program. Family Library Show - Richard offers up a variety show that includes magic, audience participation, humor and a whole lot of different ventriloquist characters, including puppets they can make at home, puppet they can find in the library. Richard also promotes reading by inspiring the children to take out the many joke books and stories they can find in the library to read and help them write funny skits and stories for their shows. "I heard nothing but rave reviews about your program! Hopefully we can have you at some of our other library branches!" As an award winning author and funny family entertainer, Ventriloquist Richard Paul offers up a unique library show that promotes summer reading and promises to be entertaining for people of all ages. Time permitting Richard will also offer autographs and meet and greet following each performance.